Many stars stopped by the NBA All-Star bash presented by Talent Resources Sports, 1Oak and TRUKFIT at Jax Brewery in New Orleans on Friday, Feb. 14. 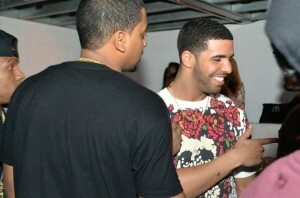 According to sources, Drake showed up at the party around 1:30 AM. He was immediately was escorted to his table which was situated next to Lil Wayne and across from Marc Cuban. Drake was welcomed with magnum bottles of Moet Nectar Rose Leopard and Ciroc. Lil Wayne congratulated Drake on his performance earlier in the evening where he mentioned that Lil Wayne will be dropping “Carter V, May 5th.” Wayne was overheard saying “The world isn’t ready for the Carter V.” Everyone wanted to part of their party, but the only ones who made it passed the velvet ropes where hot girls selected by Drake and crew. Nicki Minaj was also spotted in the building chatting it up and flirting with Houston Rocket’s James Harden. Two Chains arrived with YMCMB’s co-founder Birdman and Slim as they sat down at their table to watch Lil Wayne keep the party going into early hours of the morning. There was no doubt that this was the hottest party of the evening. Additional celebrities and athletes in attendace included; Joakim Noah (Chicago Bulls), John Wall (Washington Wizards), Paul George (Indiana Pacers), James Harden (Houston Rockets) Roger Mason Jr (Miami Heat), Kyrie Irving (Cleveland Cavaliers), DeMar DeRozan (Toronto Raptors) and Andre Iguodala (Golden State Warriors). Mark Cuban rolled through 1Oak and sat down to chat with Chicago Bulls center Joakim Noah, Noah has been in recent trade talks with the deadline on Feb. 20.